Getting engaged is exciting for every girl. You might wonder though what it is like to be the wedding planner that just said yes. As we approach another exciting engagement season I share the story of my proposal, my engagement shoot, and tips for how to make the most of the experience. Anyone who knows Bryan knows he is terrible at planning things. He is definitely not a details guy and doesn’t always do well in high pressure situations. It is part of his charm. The weekend of our proposal started with a trip to our happy place, Northern Virginia, for a quick weekend away. We spent time throughout the weekend at our favorite places, enjoyed champagne at our favorite winery, stayed at our favorite hotel, and had a great dinner. Each place we visited was better than the next and lead up to the perfect night in D.C. visiting the monuments, something we had never done before in the dark. They were amazing. He didn’t pop the question in any of these moments, and our plans for the next morning were cut short by a visit from the Pope. We decided just to head home, rest, and see our puppies. After lounging around at home for awhile we decided we needed to do at least one more thing before returning to work the next day. Afterall, the day marked our 100 monthiversary (a silly little milestone we celebrate). As we always do we took a ride to Spring Lake to walk on the beach. The weather was miserably cold and windy. Naturally, Bryan suggested we sit on the beach. He was lucky I agreed because anyone who knows me knows I absolutely hate being cold. For some reason, I stuck it out for what seemed like forever. After voicing my desire to leave several times, he kneeled on both knees in front of me (probabaly to prevent me from leaving) and asked me to marry him. I said yes, of course. He continued to prove his case as I reminded him I already answered we celebrated with my favorite champagne from our favorite winery in Virginia that he brought back just for the occasion. My ring is perfectly me. It is a champagne pink oval center stone surrounded by a petite diamond halo on a thin rose gold band with diamonds, and it is exactly my dream ring. Bryan and I had been together nearly 10 years when he proposed so I had plenty of time to saturate his email with potential ring pics. Periodically and pretty casually, we would pop into jewelry stores and try on rings. I always thought I wanted a cushion cut 2 carat diamond with a halo in an intricate white gold and diamond setting. Boy was I wrong! As soon as I put on what I thought was my dream ring I hated it! We visited a store and spent some time really trying to figure out how to make what I envisioned. Almost magically, one of the women helping us remembered one particular tray of rings they had just gotten in. On it dozens of rose gold and morganite rings in every shape and style sparkled in front of me. Among those rings was almost my dream ring. Bryan was able to work with them on customizing it to be perfect and it was the ring he surprised me with when he proposed! Once we took a little bit to soak in what had just happened after 10 long years, I called my mom and text my best friends the first ring pics on our way home. We stopped by Bryan parents house. Because nobody really expected a proposal, especially on a monday, they had the best reaction and were so excited. We also stopped by Bryan’s grandma’s house, my nana and pop pop’s house and my grandmother’s house to tell them the good news. Because we have large families, I asked our parents and grandparents to spread the word for us. Otherwise we would have been on the phone forever trying to reach everyone. Of course the word spread fast. Once we felt like everyone important knew I took to facebook for the “official” announcement. Everyone knows how much I love my coffee, especially Starbucks. So I took a walk to the Starbucks down the street and used my morning coffee cup to craft the perfect ring photo. It hung on the stirrer and written on the cup was “we’re engaged”. It was a hit and then the rest of the world knew as well. Before we were even seriously talking about an engagement I had met Jaye Kogut from Jaye Kogut Photography and told her she would be my wedding photographer one day. I’m pretty sure that was at our first meeting ever. Naturally, she didn’t believe me. 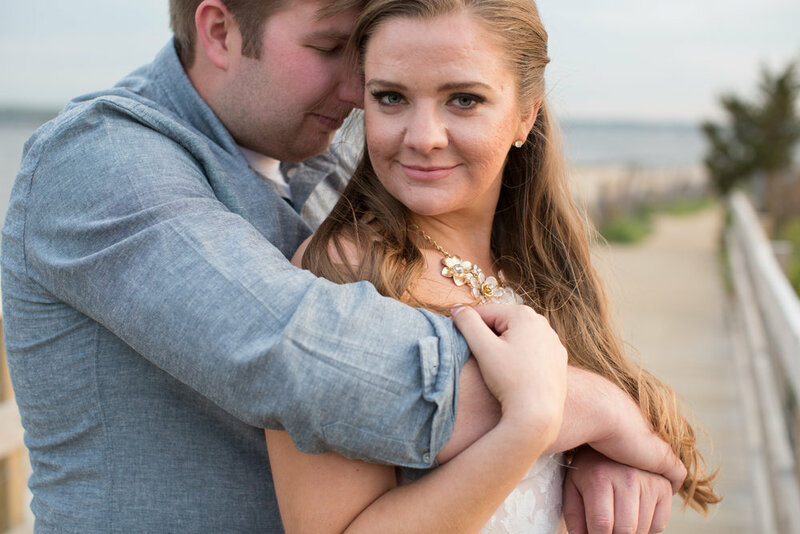 She got a call immediately and once the weather warmed up we set up an engagement photo shoot at Sandy Hook. In selecting a place to take our photos I considered places that meant a lot to us and that we visited often. We settled on a beach location because it has always been a part of our story and the beach is where Bryan proposed. Sandy Hook is a place we often visit with our dogs and has many different locations within it for photos. We took photos at the bunkers, lighthouse, and on the beach which gave us lots of variety and options. Jaye was so easy to work with, made us both comfortable, and brought out the best in us during the entire session. Shortly after she delivered countless images I still look through almost daily and display in The Zaleski Home. Choose an amazing photographer that you love! You want to love your photos! So take some time to find the right photographer for you. Consider the style of and quality of their work but also their personality. The shoot will take at least an hour so you should select a photographer that makes you feel comfortable, keeps you laughing, and instructs you throughout the shoot in a way you understand. Choose an engagement photo shoot location that speaks to you as a couple. Select a place that is important to you or that you love visiting. You will feel more comfortable and appreciate the photos so much more that way. Also think about the backdrops within the space or environment. A spot with multiple backgrounds will give you variety which is not only great for having options but also when choosing a save the date photo that works for you. Coordinating outfits ahead time will make for well dressed photos, complimentary colors, and a cohesive look. Choose outfits that work together and in a color story that suits your style and environment. For variety and options plan on doing at least one outfit change during the shoot. Before the day of your consider whether you will use these photos for a save the date or would like a certain look or feel. Bring props that have some meaning, tie into your “theme” or will work on your save the dates. Props can bring the photos to life, give you an opportunity for detail shots, and allow you to have some fun. Our favorite prop is always champagne because, well, who doesn’t love to pop champagne?! Bouquets are always great too! If you are investing in photos that will last a lifetime go the extra mile and leave it to the professionals when it comes to your hair and makeup. You want to look and feel your best during the photo shoot, not just so you get great results but also so you feel comfortable and confident. If you are taking engagement photos you will absolutely take photos with and of your ring. So clean it! Your ring should look its best too. NOW BOOKING COUPLES FOR 2019, AND 2020!